The Schuster Institute was established through a grant by Gerald and Elaine Schuster, but in recent years the grant money has proved insufficient to maintain it, according to the same email. Over the past three years, the University provided Schuster with $450,000 to make up for the lack of funds, according to Julie Jette, Director of Media Relations. Generally, “free-standing institutes or centers at universities must … largely sustain their own operations,” according to Jette’s Jan. 18 email. This board celebrates the accomplishments of Schuster over the past 14 years. The Justice Brandeis Law Project helped free two people jailed for crimes they did not commit, according to the project’s website. Other Schuster research has contributed to public health projects and helped expose instances of modern-day slavery and international adoption fraud. In addition to its invaluable work, Schuster has served as a place for undergraduates to gain skills in investigative journalism. This board commends Schuster for its contributions. With the loss of Schuster, undergraduates interested in Journalism will need new ways to gain education and experience in the field. In her Jan. 18 email, Jette explained that the University is looking for creative ways to improve the Journalism program. These include hiring a faculty member experienced in digital medi, and potentially combining Journalism and related programs into a media and communications program. This board supports the University’s efforts: Without investment, the Journalism program will wither. By reforming the program to fit contemporary needs and job markets, Brandeis will benefit in the long run as its communications program earns recognition and alumni loyalty. Unlike print journalism, digital media and communications is a flourishing industry and the University will gain by investing in it. That said, digital media and communications encompasses a range of industries — digital advertising also falls under that umbrella despite being the antithesis of news reporting. To keep the digital media program journalism-focused, this board recommends that the University create a specialized journalism track and major within the prospective media and communications department. Alternatively, the University could create an interdisciplinary Journalism program, drawing on programs such as Creative Writing, Fine Arts and Economics to build a robust, well-rounded curriculum. As the University changes its Journalism program, we also recommend that it become a major. The number of Journalism minors dropped 50 percent between 2014 and 2017, from 32 to 16. Currently, the minor is relatively rigorous; in addition to requiring five classes, typical of a Brandeis minor, the Journalism program requires students to pursue an internship or independent study, or write a thesis. While such experience is valuable, the significant time commitment involved may be dissuading students from minoring — by nature, a minor cannot be one’s main focus at University, and the course load should reflect that. Because real-world internship experience is necessary for prospective journalists — the newsroom offers an education that no class can — removing that requirement would remove a key element of the program. If Journalism were a major, students could pursue it extensively without feeling pressured to master another discipline as well. To improve the Journalism program’s experiential learning component, the University should work to build a stronger alumni network and internship program. Students should be encouraged to connect with alumni to break into the field post-college, and alumni in the Boston area should be reached out to for internship and shadowing opportunities. Loyalty begets loyalty; a strong program will grow a strong alumni network, and alumni opportunities and donations that will then further strengthen the program. 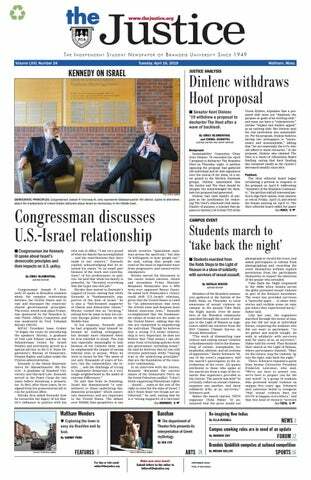 Heavily investing in Journalism as a department which makes Brandeis proud will lead to a fantastic department with strong connections — refusing to do so means letting it fizzle out. Beyond journalism’s inherent value, this board urges the University to consider how a strong news program lines up with its social justice values. In the “fake news” era, digital literacy and reliable reporting are the bulwarks of democracy; seeking truth and reporting it is a means of pursuing justice and freedom. It only makes sense that Brandeis puts itself on the forefront of this effort — what better way to honor Justice Brandeis’ legacy? Editor's Note: Senior Editor Amber Miles works at the Schuster Institute for Investigative Journalism and did not participate in the writing or discussion of this editorial.